Such a pretty scene! 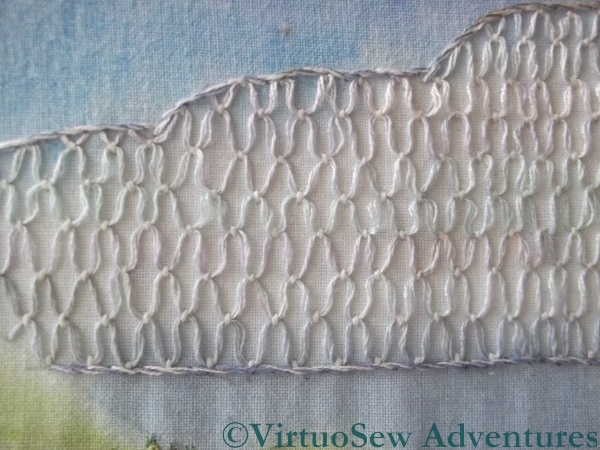 That cloud stitch is so charming! Its fun to go back in time and look at what we were working on at that time — sort of a time capsule. I love the wagon. It’s very effective and very evocative. It brings back memories for me, too. 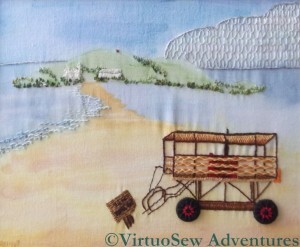 I am sure I went to Burgh Island on that tractor (or a predecessor) when I was a very little girl, over 50 years ago. 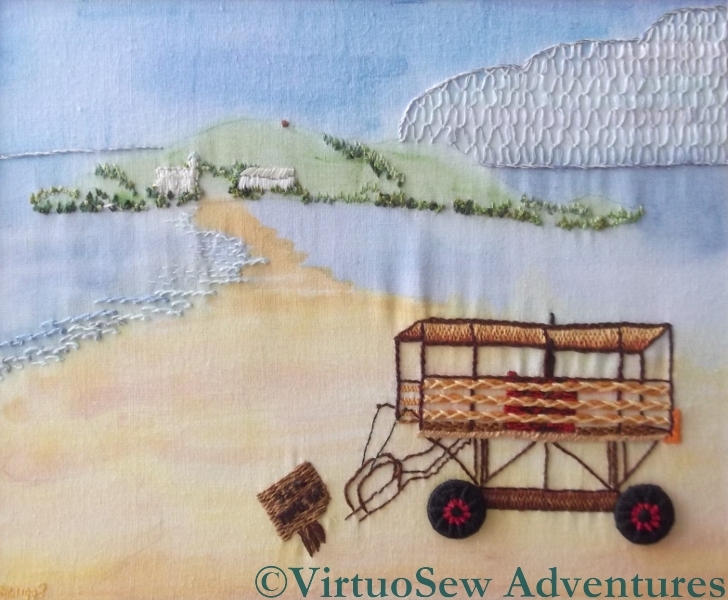 I was thining of it just a day or two ago but I’d forgotten where it was – I remembered it as ‘Big Island’ – but as soon as I saw your embroidery, I said: Hey, that’s my island! Thanks so much for posting the picture and solving that little mystery for me. Very very pretty scenery with painting and stitches. LOVE the hillside so much, the color shades are beautiful. Such a pleasing picture of arts. As this is part one, I hope part two is going to show us the details of the tractor. I love the way you worked the cloud. 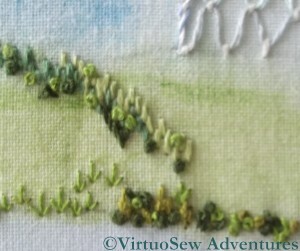 I think you should come and stay with me, and stitch some of the dozens of flowers I still have to embroider! It’s really interesting to see the development from the previous embroideries to something that holds echoes of the way you work now. I think the perspective of the island is excellent – and so hard to get right. 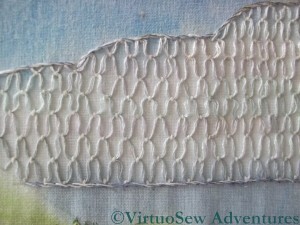 The filling stitch on the cloud is lovely and I’d love a close up of the Dorset button tractor wheels. I love that you have these pieces with memories attached…. I’m pretty sure this is the place we went to view the eclipse in August 1999. Is it near Kingswood, and the island has an art deco hotel and nothing else apart from grass, sand, etc? I don’t recognise the name of the island but we saw the tractors like the one you depicted here. We didn’t use a tractor to get out to the island because the tide was out and we could walk across both ways. Lovely colours and obviously an accurate depiction of the tractor, since I can vouch for its location on the basis only of seeing that in your piece!